Former FAI chief John Delaney will still be paid a six-figure salary in his new role with the organisation. The football association has refused to give exact details of his new payment entitlements, other than to say he has taken a "substantial reduction" on the €360,000 he has been receiving as chief executive. However, it is understood Mr Delaney's role as "executive vice president" will come with a salary in the region of €120,000. In a shock move on Saturday night, it was announced that Delaney was stepping down as the boss of the FAI and will now take up the new role. A source told the Herald he will not return to the position of CEO in the future. The news came just one week after it emerged that he had paid €100,000 to the association in the form of a bridging loan back in 2017. However, the FAI said that the changes were a consequence of a governance review commissioned in February and undertaken by sports governance consultancy Jonathan Hall Associates. Sport Ireland said its board members were not aware that this review had taken place. "Sport Ireland was not consulted on the commissioning of the report into the structures in the FAI," a spokesperson said. Over the weekend it was also reported in the Sunday Times that the FAI has been paying €3,000 for Mr Delaney's rent. The payment was said to be for a property in Kilmacanogue, Co Wicklow. The FAI confirmed Delaney will attend a meeting with the Oireachtas Committee on Sport next month. 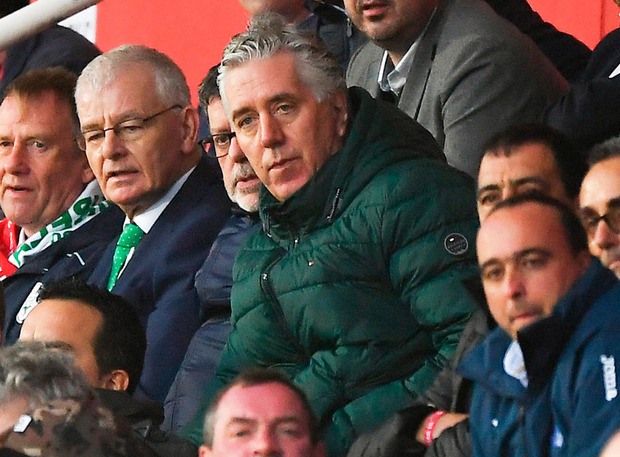 "That meeting is currently scheduled for April 10 and the FAI has written to the committee offering to bring the meeting forward to April 3," a spokesperson for the FAI said. "As regards John Delaney's salary in his new role... the FAI can confirm that the salary is substantially less than the salary he previously received as CEO." FAI chief operating officer Rea Walshe has been appointed interim chief executive, with the association confirming that they hope to unveil a permanent hire at their AGM on July 27. An external recruitment agency will take the role of finding the new chief executive. Advertisements for the job will be published as early as next week, with interviews expected to take place in late April, early May. In a statement, the FAI described Mr Delaney's new duties. "The new role of executive vice president would be a specific, defined role with responsibility for a range of international matters and special projects on behalf of the FAI. "It is envisaged that the current CEO would step into this new role. "This would allow Irish football to continue to benefit from his extensive football experience and contacts across Europe and the rest of the world." It said a new chief executive officer should be recruited to be responsible for all the other issues typically overseen by a chief executive of a national association. Meanwhile, government TD Noel Rock has called for a complete audit of the FAI's accounts, saying it is "both urgent and necessary". He described the decision to change Mr Delaney's position a "farce reshuffle" that has been given "unanimous approval" by other board members. "This is shoddy, slapdash decision-making and bad corporate governance: this board has been in place for too long and is too beholden to the former CEO. "Withholding of state funding may well be necessary, and we should reserve this position. In the meantime, a complete audit of the accounts is both urgent and necessary," he said. Social Democrats co-leader Catherine Murphy, who is a member of the Oireachtas Sports Committee alongside Mr Rock, also said it would be "beneficial" for audited accounts to be released. She said it would help remove the shadow that has been hanging over the FAI since the news broke of the €100,000 loan to address a cashflow issue in 2017. "There's an opportunity in all of this for a new start," she said. Ms Murphy also questioned the new role created for soccer chief, saying it came "out of the blue". "We'll have to tease that out [when he comes before the Committee]. Where did that come from and the rationale for that? Taoiseach Leo Varadkar said the Government wants to be sure that any taxpayers' money given to the FAI has been spent on the purposes intended. Asked if was aware of any financial issues during his time as minister for sport, Mr Varadkar replied: "Oh God, no."